Sopcast is a p2p program, which allows live streams of tv channels to receive. This includes also chinese stations, among other things, the german bundesliga or the champions league. The principle of the distribution of the data is similar to a bittorrent network and thus ensures faster data transfer without connection faults. The free internet tv software sopcast comes from china, but it has a user friendly interface in german language. The p2p based program allows the reception of many live streams of different tv channels such as, for example, the chinese cctv 5 channel. It takes place among the users of a decentralized distribution of the streams, which the server is relieved, and failures of the connection to be avoided. The required image quality of the programmes is very satisfactory, because the bit rate of the streams is between 100kb/sec and 400 kb/sec. This is a dsl 1000 connection is absolutely sufficient. Before a big event, the user should, however, give sufficient lead time to schedule. Note: because of the generally poor availability of downloads on the asian servers are all programs in germany network hosted. 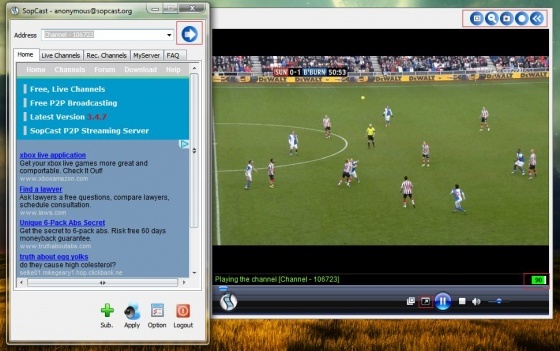 Sopcast is a useful software to a pc on online channels to prepare. However the available streams, unfortunately, on a few, mainly chinese tv channels is limited and therefore not a particularly diverse selection of programs. Moreover, the system is at major sporting events or other live broadcasts quickly overloaded and requires a lot of patience. Also therefore, it is recommended the parallel use of different streaming programs. You can free download SopCast latest full version from LoadSafeSoft.